What you eat before, during and after a workout can really help you get the most out of your time spent in the gym or running along the trails! 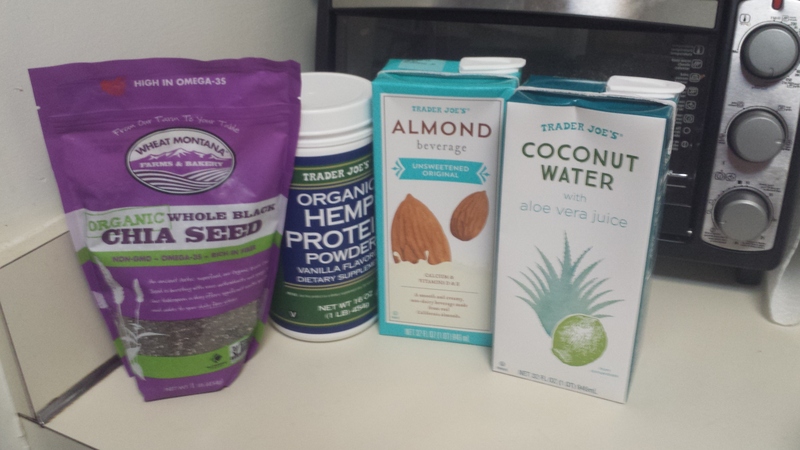 I figured since we are heading into fall marathon training season, now is as good time as any to share what I personally do for workout nutrition! 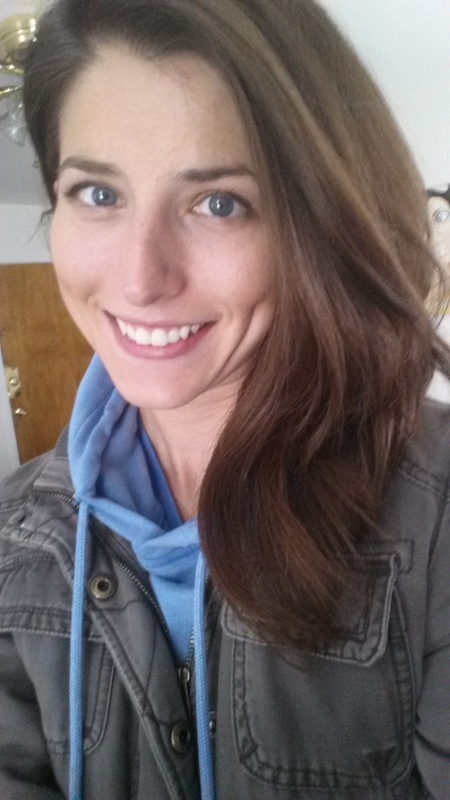 The peeps over at Eat The Bear Fit wanted to hear about my nutrition and helped inspire this post! They also have a great resource page for pre-workout supplements and fitness. You can check it out here! 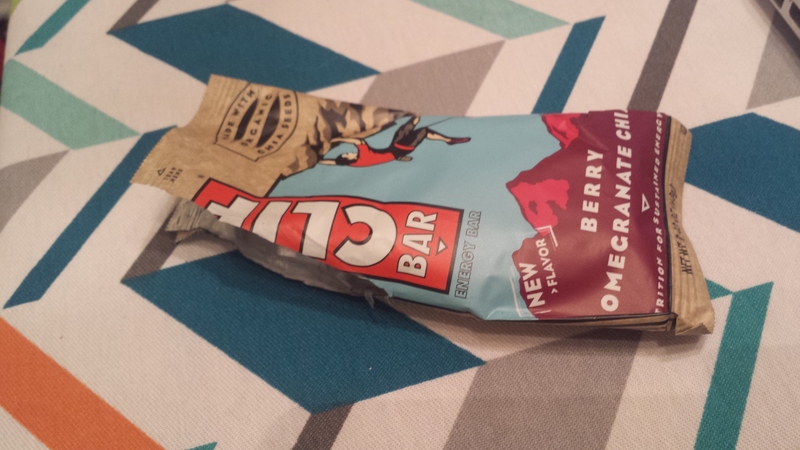 Pre Workout: I always try to eat a little something about an hour before I start a workout. I tell my clients to do the same because if you don’t have some carbohydrates in your system for energy there’s a good chance you will tire out easily or even get dizzy & pass out if you are doing strenuous exercises. Seriously. Coffee. All. Day. Long. 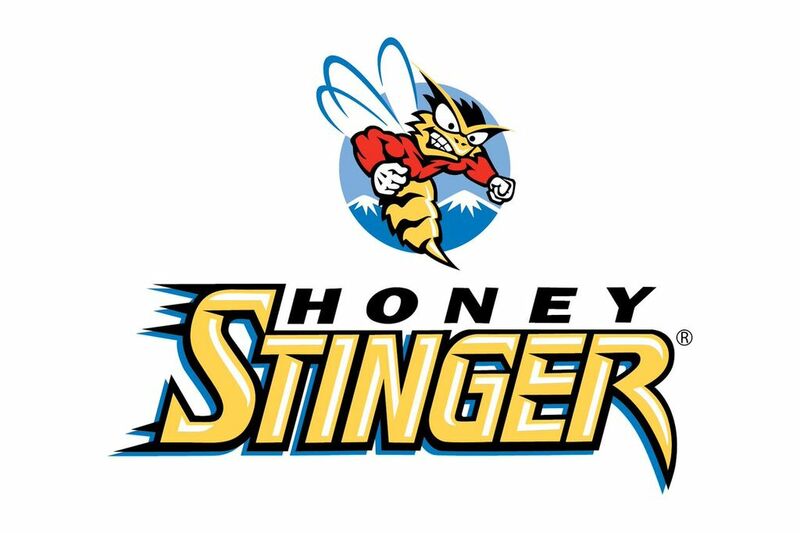 During Workout: If I have a running workout over 60 minutes I make sure to bring a Honey Stinger gel along for the run and will eat it slowly, starting at the 45 minute mark. If I’m strength training I won’t eat anything during, until after I finish (see Post Workout). I always drink water throughout the workout and if it’s really hot outside, or i know i’m in for a tough sweat sesh, I throw a Nuun tablet in my bottle for the added sodium & electrolytes! Post Workout: To maximize muscle recovery it is important to eat or drink protein within 30 minutes post workout. Protein is essential for muscle building and repairing. When you workout you are creating micro tears in your muscles. The protein is needed after to repair muscles so you come out the other end gaining strength and lean muscle mass. Some days I use protein shakes and others I have nuts or greek yogurt. Honestly, it just depends whats on hand or if i’m home or at the gym. Either way, I ALWAYS make sure to have a post-workout snack of about 150-250 calories. 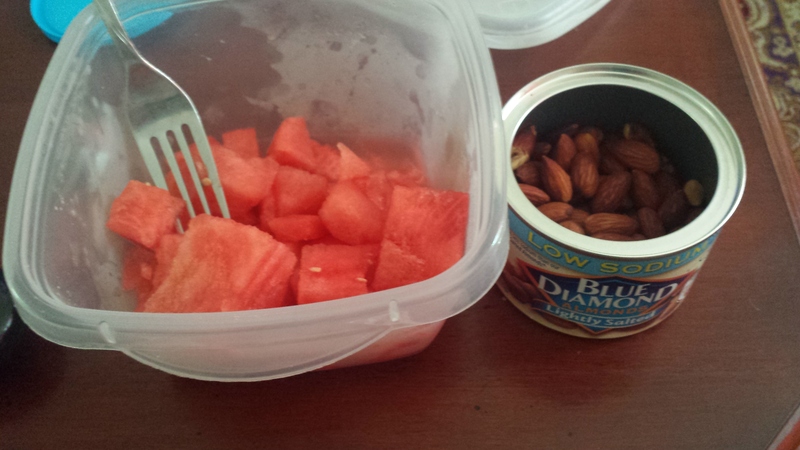 My current go-to has been watermelon & almonds. 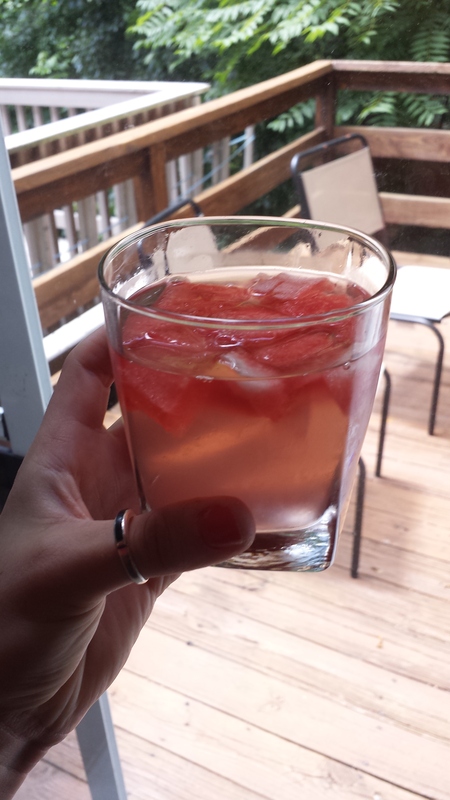 Coconut water & watermelon…most refreshing post workout drink! 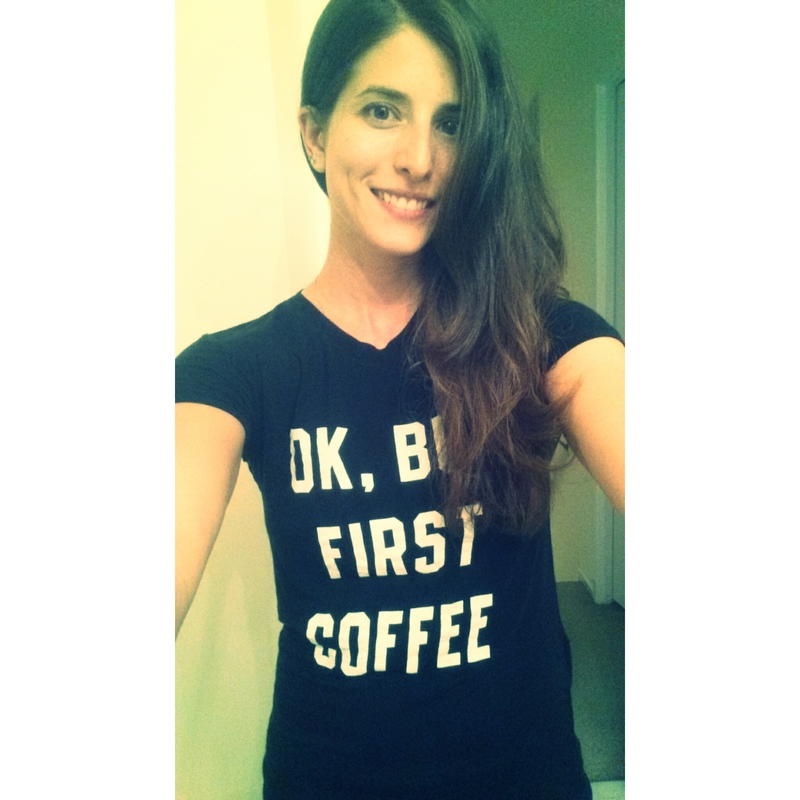 Now that I shared what I do, what are your go-to’s for pre, during & post workout? Categories: Uncategorized | Tags: eat the bear fitness, etb fit, Honey Stingers, Nuun, Nuun Energy, pre workout, pre workout nutrition, running nutrition, Trader Joes hemp protein, watermelon, what to eat after a workout, what to eat after running, what to eat before a workout, what to eat during a workout | Permalink. Well, i’m not sick, just suffering from severe sinus and allergies. 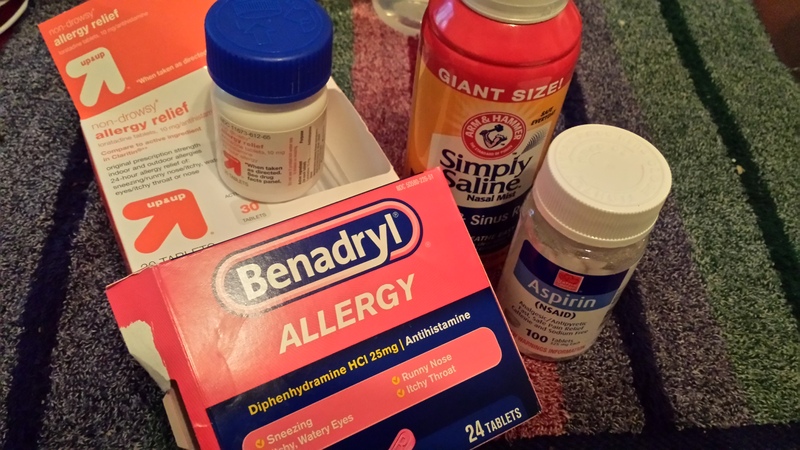 I had a strange allergic reaction to generic brand sinus meds…yes that’s what i said, allergic reaction to allergy medicine. What is wrong with me!? My eyelids were super red, raw and burning for two days. 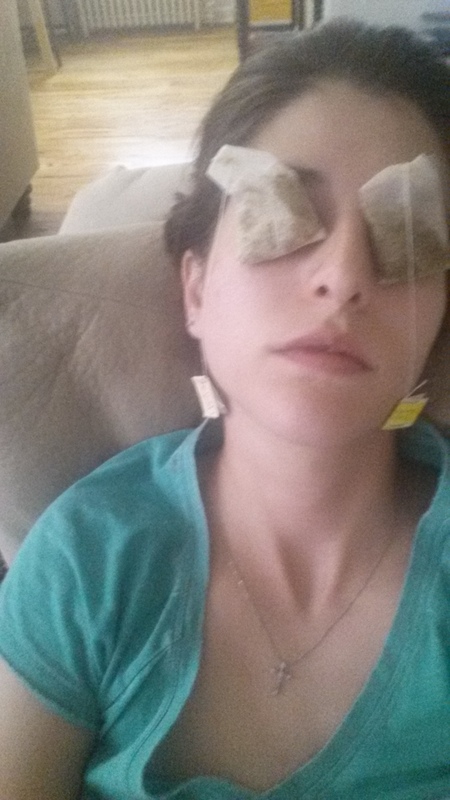 I didn’t take a picture of it (you’re welcome) but I did take one of me and my glamorous life with chilled chamomile tea bags de-puffing my lids. I made a quick stop at Target and bought out their allergy section. I hate taking medicine. Besides the fact that my eyelids have gone back to normal, thank you Benadryl, i’m feeling much better in the sinus department. Still super congested without meds, but I’ll deal with that after the race! I did a training run Tuesday that gave me a huge boost of confidence while running with sinus congestion. It was scheduled as 2 easy miles, 1 moderate, 2 at goal race pace. I tried not to push it, in case my energy wasn’t there, and also I don’t want to be sore heading into a race. 8:07, 7:29, 6:28, 7:17, 7:13. I don’t know what the heck happened, but I acquired a new mile PR with 6:28. As soon as the Garmin flashed that mile split, I slowed down. Even though I was feeling fine, i knew that is no where close to my actual race pace. I was happy with the last two splits which were closer to where I’m attempting to hang at tomorrow. Gonna have to keep telling myself not to go out too fast! 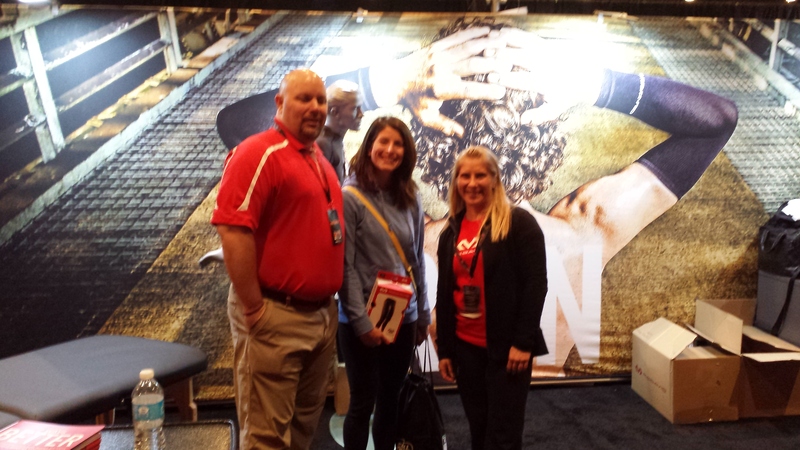 Yesterday I headed to the Expo at the DC Armory. If you can, always head to the expos on the first day, that way everyone working the booths are well stocked, happy and energetic :). 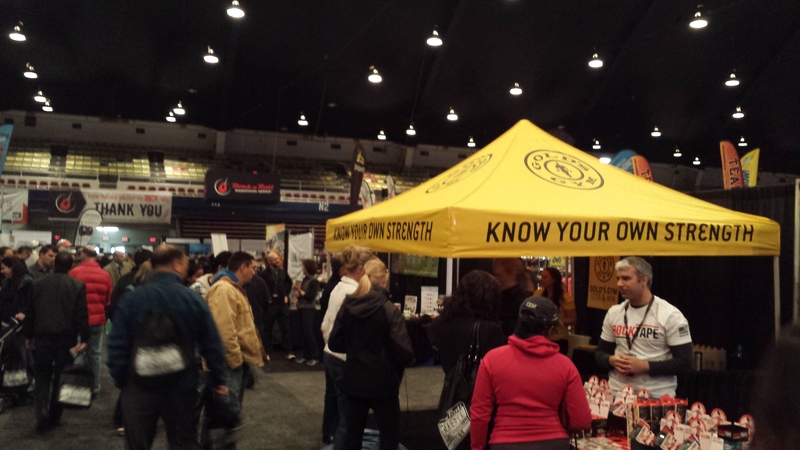 I didn’t do a ton of sampling, but I did stop at the Gold’s Gym tent and got to talk with a few girls from our marketing department. It’s always fun to put a face to a name! 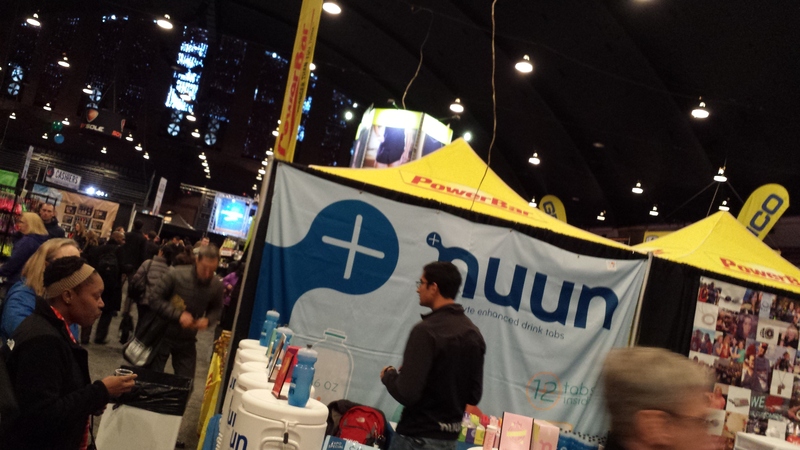 Of course I had to stop at the Nuun station. If you ever want to stock up, usually they have a good deal at Expos, $5 per tube, buy 2 tubes and get a water bottle free! 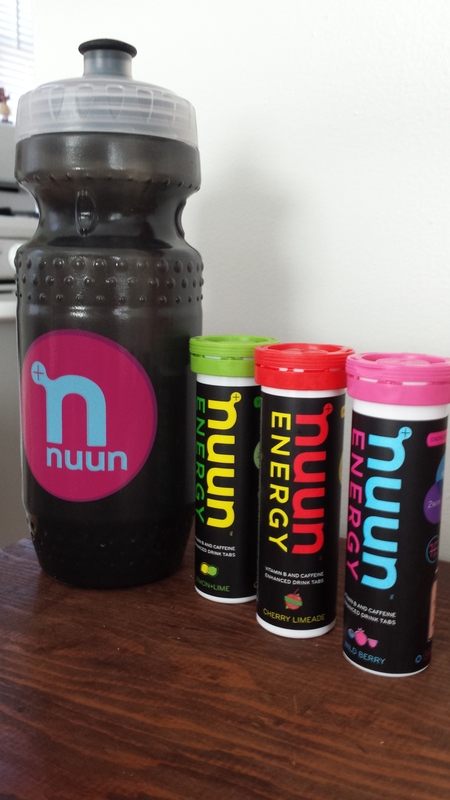 I only got 2 tubes from the expo because I just got a shipment of new Nuun Energy– caffeine flavors! 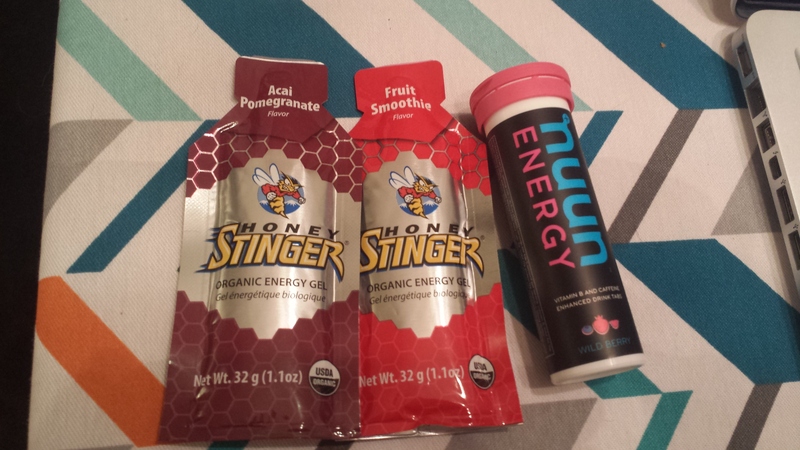 Lemon-line, Cherry Limeade & Wild Berry! The last tent I stopped at was McDavid Compression. I told them i had JUST heard of them days before the expo because i’ve been in search for full compression tights. We all ended up chatting for almost half an hour about compression, marathoning, crossfit, personal training…and they were kind enough to give me a pair to try & report on! Jeff, Me & Marcie, totally not prepared to take a picture–we were still talking through the photo op! I’m literally wearing them right now in hopes my legs feel super fresh tomorrow morning. I’ll do a full review on them next week. I’m also planning on wearing them after the race all afternoon to speed recovery so i can jump right into marathon training! Suffering from sinuses, but i’m gonna fake it till i race! 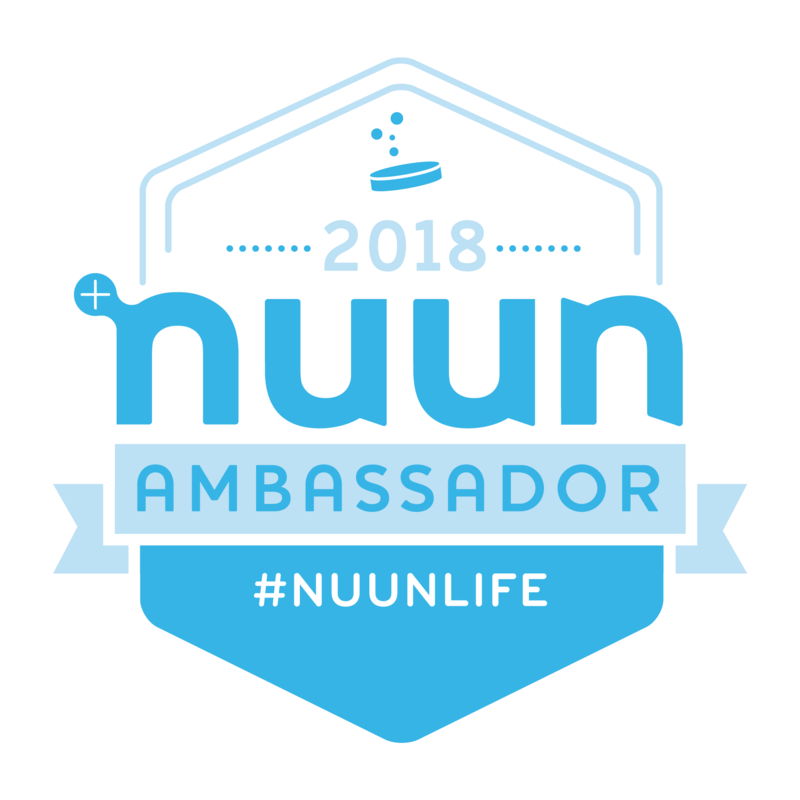 Categories: Uncategorized | Tags: McDavid Compression, Nuun, Nuun Energy, Rock 'n' Roll USA, running with allergies | Permalink.